Shabda (or Nada-Brahman) is a spiritual musical sound that can be heard during yogic meditation and is believed to have a spiritually transformative power. This belief in the spiritual nature of both the inner spiritual sounds of meditation and physical outer sounds of mantra and chanting (shabda is associated with both) is a common one throughout India today. Both kinds of sounds have a special power for the spiritual traveler. Part of the power of sound arises from its ability to create a form of continuous awareness which is a necessary component in the practice of almost all meditative traditions. Buddhist and Hindu practicianers struggle with concentration exercises to focus on some object such as the breath to create this continuous awareness in order to bring about shamatha or samadhi. But the inner sounds of Shabda and the outer practices of kirtan, mantra (Hinduism), or Zikr (Islam) all provide a less rigorous, alternative method of creating this kind of continuous awareness as practicianers immerse themselves in continuous and unbroken waves of sound. The emphasis on inner spiritual sounds or a "current of sound" is seen especially in the Sikh and Radha Soami traditions in the Punjab, and was a common theme in the poetry of a popular medieval saint named Kabir who was born in Varanasi in the fifteenth century. Kabir is highly respected by these groups and his poetry has been elevated to scripture by being included in their holy books. The Sikh holy book, the Adi Granth, contains 292 shababs or verses of Kabir poetry. Unfortunately, it is taboo in many of these traditions to speak or write about personal religious experience. It is therefore difficult to find autobiographical examples of this kind of religious experience except indirectly in the poetry of various saints from northwest India. The theme of sacred sound can also be seen in the ideas of such popular Hindu teachers as Swami Sivananda, Guru Maharaj Ji, Paramahamsa Yogananda, and Rajneesh (Osho). We have already mentioned the experience of sound that is associated with helping the soul leave the body on the Conscious Transitions Out Of The Body page, but here we will look at sounds which accomplish something equally important. This new class of sounds move the soul through different states of being once it has left the physical body. The view that the universe contains waves or currents that can be perceived as sound which move between the two poles of existence is a common theme in the Shabda Yoga traditions. The first pole is in the higher spiritual planes of being where the templates for all life forms and the templates that define the basic order of the material world are said to exist. The second and opposite pole is manifestation, and the physical world as we normally perceive it. These traditions claim that on one hand there is a flow of creative energy or spirit issuing from the first pole that is responsible for the material order and evolution we see around us. The consciousness present in life forms is said to depend on this outward expanding spiritual flow. In this world view, the universe is being constantly created or recreated, and refreshed or renewed by this outward flow. On the other hand there is also said to be a returning flow which reverses creation, and draws or carries the traveler back from the second pole or material world to his or her origins in the spiritual realms. The salient point of this discussion lies in the fact that the spiritual traveler who can perceive these returning currents of sound can learn to catch the returning wave, and ride it back to higher planes of being. This is the reason for our interest in these sound currents. They serve both as the mechanism of travel, and a compass orienting the traveler pointing the way through the psychic planes and into the spiritual planes. The ability to tune the soul to perceive the sounds of Shabda must come first, and the ability to catch them, and metaphorically ride them is a more advanced stage. The advanced stage involves transitioning from immersion in a single "lower" sound associated with a psychic state represented by, for instance, the sound of drums or thunder to the higher sounds of flutes, violins, or vinas which are associated with different heavenly or spiritual worlds. Developing one's spiritual hearing is a process that takes time and effort, and is a worthy goal on the spiritual path. It is also a skill that is sometimes ignored or overlooked. 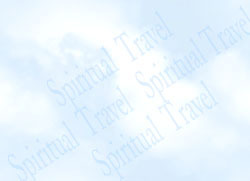 The spiritual traveler needs to take a special interest in this form of spiritual development to truly understand the kind of freedom and knowledge that spiritual travel can offer. The following experiences and poems describe some sample encounters with sacred sound in spiritual travel. Kabir, the medieval Hindu-Muslim mystic poet describes his experience of spiritual travel in poetic form. He begins with a reference to a world where sacred music fills the sky. A dream in which symbolism from the unconscious erupts into a spiritual travel experience. Encountering Shabda when it manifests as the sound of a speeding train. A Hawaiian Shaman hears the roaring sound that accompanies the opening of the "inner doorway"
Simple spiritual practices such as mantra meditation (repeating sacred words or sounds) can have dramatic effects when practiced during spiritual travel even when the same practice has little or no effect when done during normal meditation. Singing can create an echo effect filling the sky with spiritual sound. At the final stage of a detailed guided spiritual travel experience, Morimitsu is shown the pure worlds of Spirit by his guide. Here, Kabir writes about listening to inner spiritual sounds that take the form of conches and bells. Like many mystical experiences, this one contains a mixture of the elements of sacred light and sound.